It’s been a hot minute since I’ve gone on a good old-fashioned roadtrip. I love to camp, but oftentimes it’s on my own & only for a day or two when I can squish it into my perpetually crazy schedule. 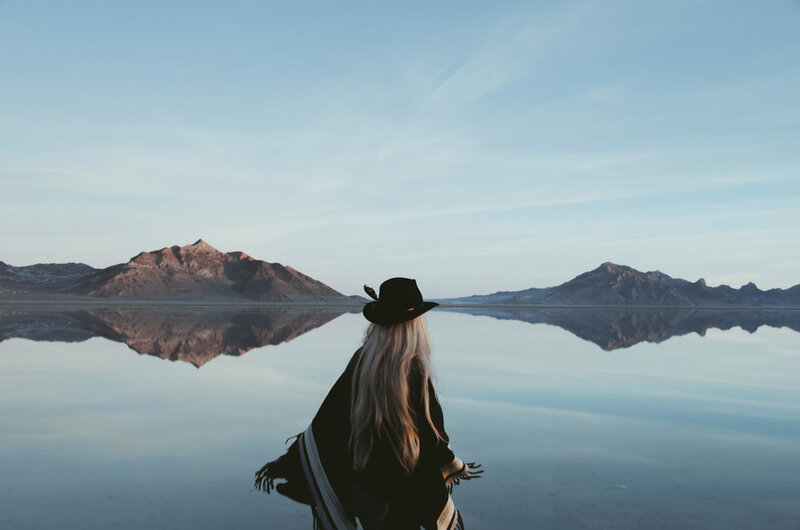 So when my amazing, adventurous friend Kara suggested a week-long roadtrip to Salt Lake City, Utah & back, my response was an instant, resounding “yes!”. You never have to ask me twice if you offer me the opportunity to cram my camping gear, my camera gear, some food, & some warm clothes in a car & get out of town for a bit. 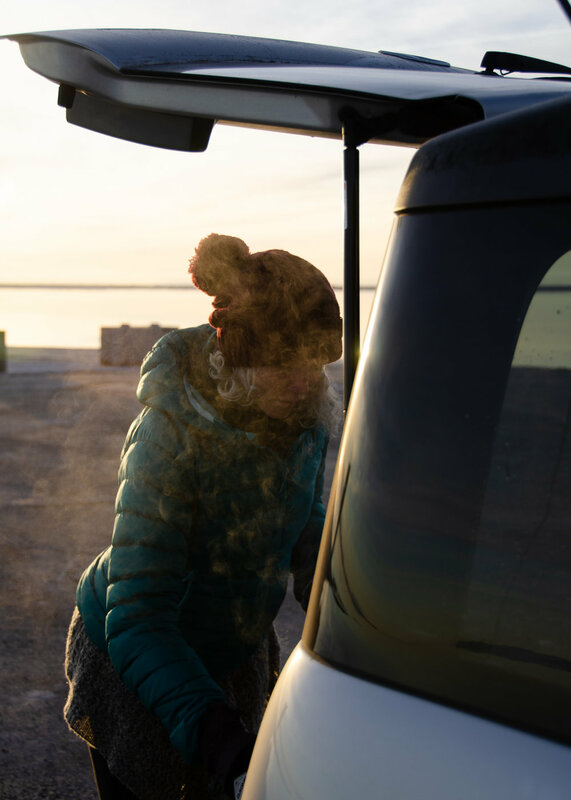 Car camping in December is always a bit of a gamble, as you never really know what sort of weather or road conditions Mother Nature will gift you with…but she smiled on us this entire week. No icy roads, no snowstorms, no unexpected catastrophes - this particular trip was truly all sunshine & magic. After a leisurely drive out of Portland, Oregon & few hours spent in Bend, Oregon, we finally arrived at Crystal Crane Hot Springs after dark. The camp host was gracious enough to let us check in two hours later than our scheduled time (oops) & after finding the perfect spot to park our car, we ran to the hot springs pool & braved the icy 16F air to soak in the pool for a little while. My iPhone promptly died after being brought out into the freezing cold, so I unfortunately got no photos of the hot springs at night as I was in no mood to try & set up my tripod & DSLR instead. It was cold, guys. I don’t blame my iPhone for its instant #nope response to the weather. After a very cold night’s sleep in Kara’s car, we woke up to ice on the inside of the windows & the most stunning sunrise I have ever seen. It was absolutely magical. I haven’t done any color editing to these photos of the tipis next to our parking lot…the sky was truly that pastel in real life. We bundled up & stumbled out of our sleeping bags to take it all in while making our tailgate breakfast and doing our best to keep our fingers from freezing. The cold is more than worth it when you get to wake up to hot coffee, jackrabbits scuttling through the snow, and the faint sound of coyotes in the distance. If you’re ever in the area, Crystal Crane is definitely worth the stop…& if you have the bucks to spend, you can rent the tipi & have the private soaking pool that’s inside all to yourself. Next time, I’ll shell it out to freeze in the tipi instead of in the car. 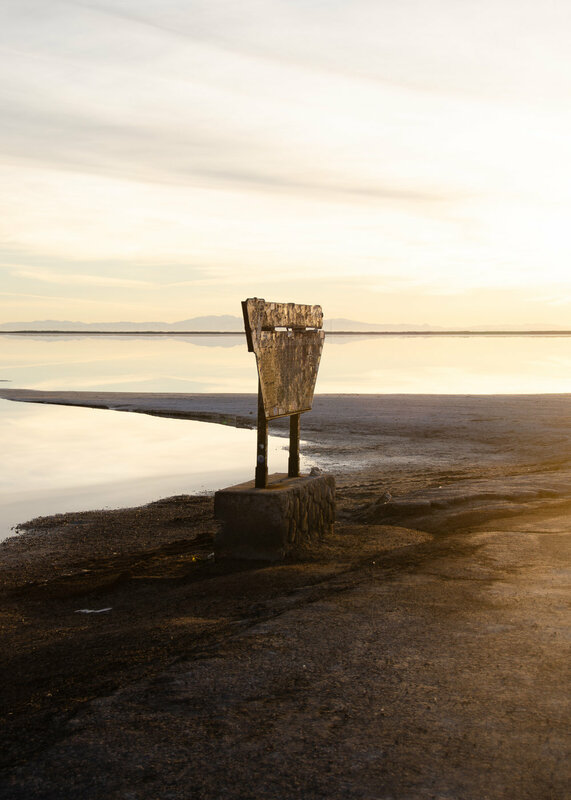 After saying goodbye to Crystal Crane Hot springs, we got back on the road & started the eight hour drive to our next destination - Bonneville Salt Flats. We drove down through Northern Nevada but didn’t make any stops to speak of, & arrived at the flats about an hour or two before dark. After some driving around, we determined that there were no dry portions of the flats due to the fact that it’s winter & it’s not warm enough to evaporate that top layer of water that sits on the nearly 30,000 acres of land that makes up the flats. We drove around to a few different spots & finally settled on a place off the main road & on the edge of the flats to make camp for the night. We took advantage of the last few minutes of light to get some fun silhouette shots of Kara & I against the lake & the setting sun, then dug out our camp stove to have dinner & get set for the night. After it got completely dark, I dug out my tripod & decided to try my hand at some Astrophotography. It takes a lot of patience, but there’s nothing quite as satisfying as seeing that amazing, perfectly starlight shot on the back of your camera after going through all the trial & error effort to find the right focus point and exposure length. For my fellow camera nerds, the shot above is of me out on a little spit of land that reaches out into the flats (thank you, Kara for being my human remote!) on a tripod at 18mm, f 3.5, ISO 320, with a 30 second exposure. I lifted the exposure a bit in post, but that’s all…the stars were perfectly bright, the lights from the freeway lit up the horizon, & we even noticed a few shooting stars here & there. After a couple hours of playing with my camera & the stars, we snuggled back into our sleeping bags (this time with all of our snow gear on as well) & had a slightly warmer night of sleep at 20F. After another beautiful sunrise & an hour of shooting with the morning light, we got back on the road & drove the last two hours to Salt Lake City. 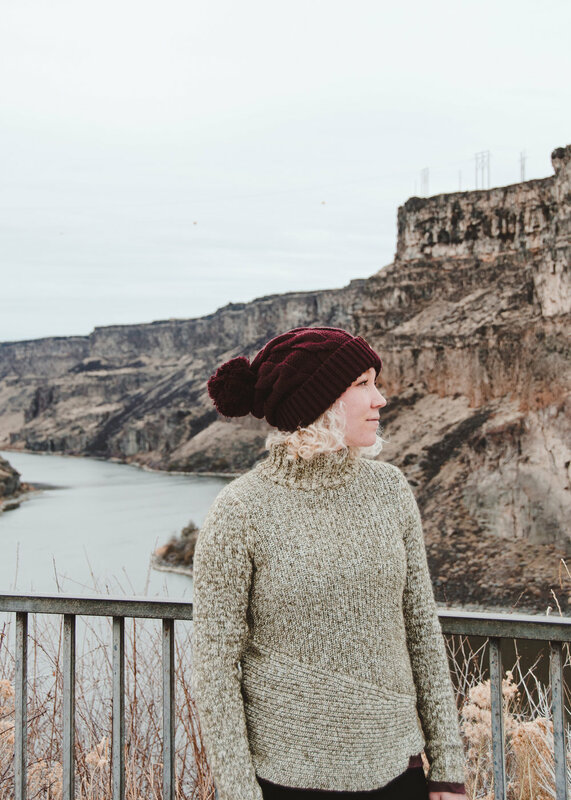 If you keep your eyes & your mind open, you’ll often find a surprise destination along your way…Kara noticed a sign for Shoshone Falls along the highway as we drove through Idaho & we decided to make a detour to go check it out. Not only were there several amazing viewpoints next to these falls, but we discovered the coolest little frozen waterfalls & were very grateful to be able to stretch our legs and run around the rocks for an hour or two. 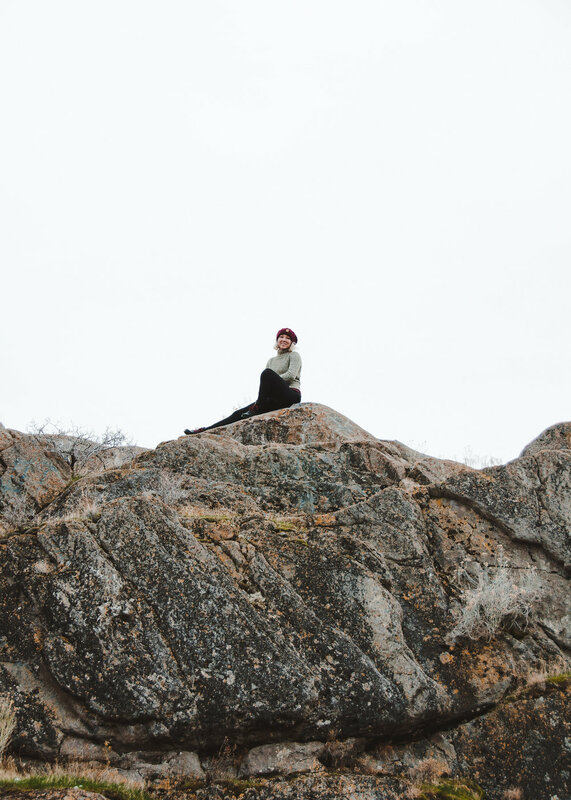 We definitely turned a blind eye to the signs that warned us not to explore too far beyond the fences & scrambled around the little cliffs by ourselves to take in some different views & get a closer look at the back side of the falls. I was excited to get a few interesting landscape shots in between exploring rock caves & discovering new plants…I’ve been so caught up in the world of portrait photography for such a long time that i’ve forgotten how relaxing it is to just exist in a landscape & to take your time experiencing it from different angles & at different times of day. Photographing people & photographing nature both require so much patience…but somehow, one can often feel relaxing & the other not, depending on the subject and the landscape. I have always felt that I have so much to learn from both people & places, which is probably why I truly enjoy switching between documenting one & documenting the other as often as I can. I couldn’t write this post without including a few photos of the wildlife we saw throughout the drive! 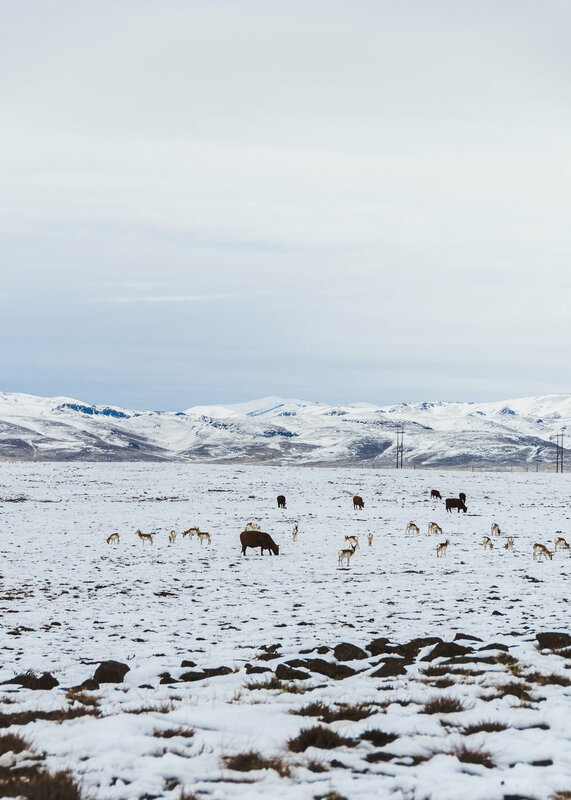 Somewhere in Idaho we spotted this herd of Pronghorn Antelope hanging out with the cattle along the side of the freeway & pulled over for a bit to watch them side-eye us while grazing. 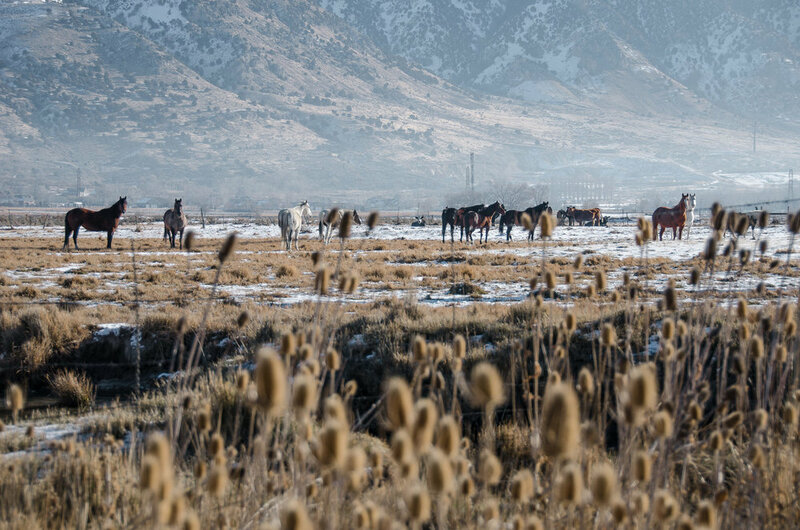 Below, outside of Salt Lake City, we pulled over again to hang out with this little group of horses for a few moments. 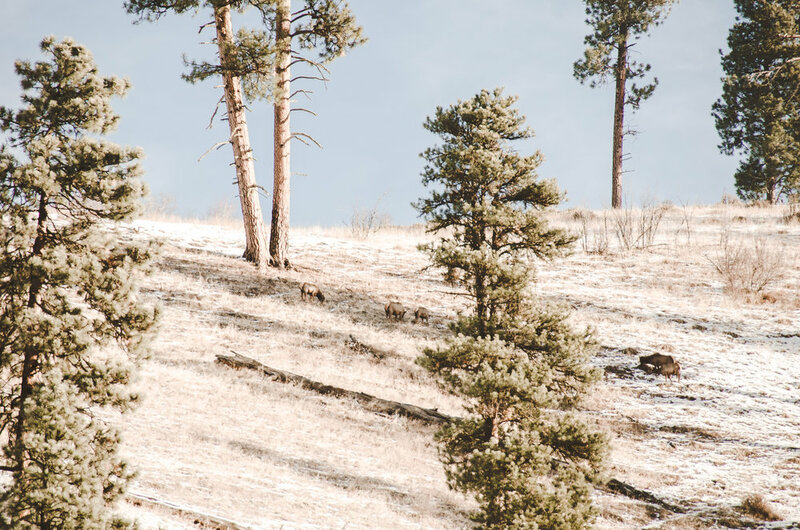 Last but not least, in the bottom left, we were lucky enough to spot a few Elk on the hills high above us as we spent our last morning in Kirkham Hot Springs. Elk are among my favorite animals, & I had been hoping against hope to see some at some point during this trip. And as luck would have it…the universe gifted me a few in the far distance on the last day. My favorite stop of all - Kirkham Hot Springs! 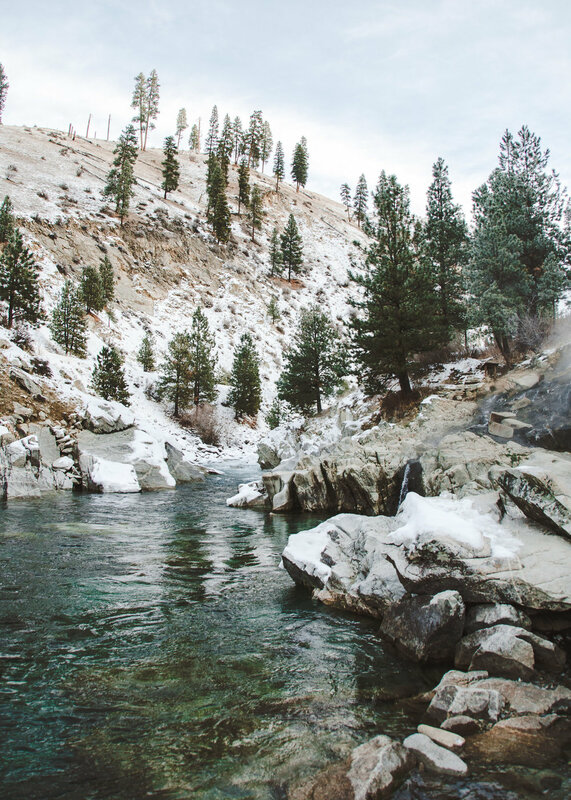 There are many natural hot springs along the Payette river, & this little oasis was more than worth the two hours drive back down through the mountains of Idaho. We arrived after dark & immediately shuffled down through the snow with our headlamps & found our own little pool to warm up in. After an hour of soaking & hanging out with some of the other people visiting the springs, we went back to the car & hung out on the tailgate chatting & eating our dinner. We saw a silent coyote run by on the road next to us & marveled at how much warmer we felt being in 30F air rather than 16F - 20F air. 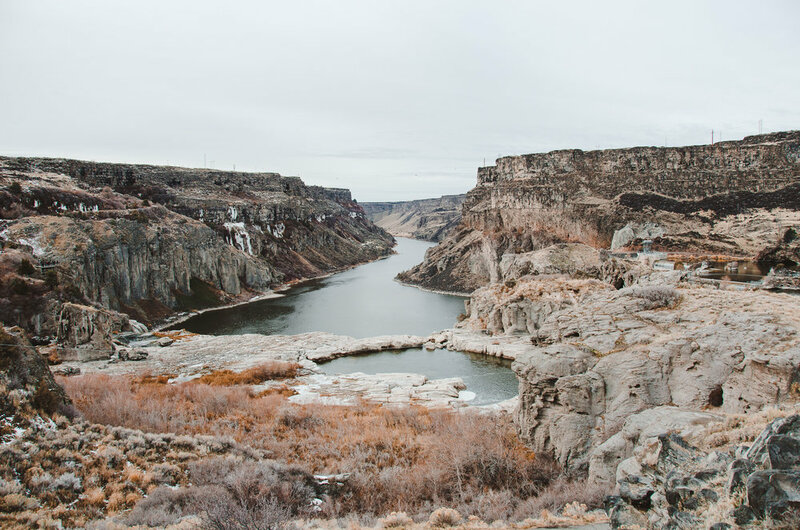 The next morning, we brought our little camp stove down to the pools & made breakfast on the side of the river while watching Elk & Deer on the hillside & taking photos of the truly breathtaking scenery. We were all by ourselves for the first hour, & both of us couldn’t stop talking about magical the steaming waterfalls were & how unbelievably lucky we were to have such perfect winter weather & to have been able to get to the springs with no mishaps of any kind. My iPhone died instantly from the cold (again) but thankfully it was just warm enough that I could scramble around in my swimsuit & still manage not to drop my camera in the springs or take too many blurry pictures from shivering. I wish I’d been able to get a better footing on the icy rocks so that I could get more angles, but when you’re climbing around barefoot & practically naked on frozen rocks, getting the perfect shot takes low priority to hopping back in the springs ASAP to get warm. For anyone who is willing to take the drive back into the mountains to have that winter hot springs experience, Kirkham was more than worth the effort - the roads were surprisingly well maintained & all the people we encountered were friendly & welcoming. After tearing ourselves away from the Hot Springs, we made the drive back through the mountains & stopped a few times to take in all of the gorgeous views. Seven hours later, we were safely back in Portland! I have to say a HUGE thanks to the amazing Kara, who was the ideal roadtrip partner & graciously drove her car the entire way. Guess i’d better learn how to drive a stick so I can share some of the driving load next time. We both ended the trip feeling so blessed by each other’s company & very refreshed by the break from our normal day-to-day work schedules. 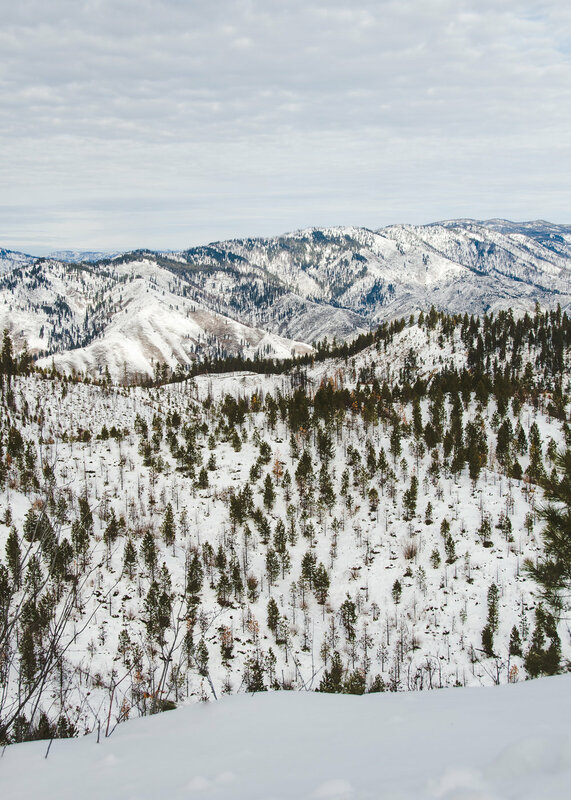 If it were up to me, i’d constantly be out in Nature just eating soup, making campfires, & lounging in hot springs, but sadly, I’m not quite at retirement age yet. Someday! The amazing Kara in all her glory! Just outside Idaho City, ID.